Aiming for the proverbial “win-win,” Cooper’s institutional research arm, The C.V. Starr Research Foundation, has teamed up with Hotseat Chassis Inc., a maker of customizable driving simulation equipment with the common goal of reducing teenage motor vehicle accidents and earning money as well. Looking to garner interest from the private and public sectors, the Defensive Teen project, as it is currently called, continues Cooper’s history of innovating while making inroads toward a new model of profiting from that innovation. 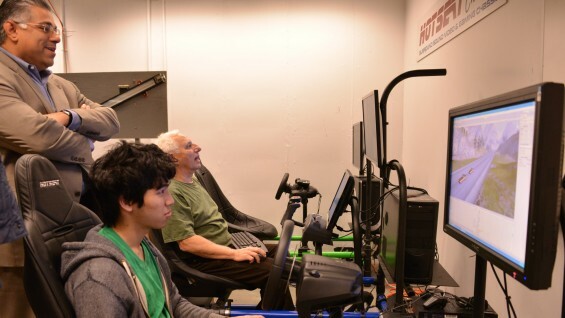 Tucked into the corner of a sub-basement lab at 41 Cooper Square sit two driving simulators and one flying simulator provided by Jay Leboff, owner of Hotseat Chassis, Inc. Normally sold to private and government entities, according to Leboff, each has an adjustable seat, controller, pedals, surround-sound mini speakers and a flat-screen monitor. Some visitors may have flashbacks to spending a dollar at the mall arcade to play “California Speed” or many other racing games. “Two years from now we will be putting these units in high schools,” Jay Leboff says, outlining part of the Defensive Teen project's aggressive timeline. But instead of playing games the students will be learning crucial defensive driving skills through game-like exercises. “This is not to teach them how to stop at a stop sign or use a turn signal,” Leboff says. Students will already have their six-month learner's permit by the time they sit in the virtual driver's seat. First they will watch a short film introducing an exercise and then be charged with trying to safely navigate a real-world scenario, like a rain-slicked highway. Augmented by sound and force-feedback, as when the steering wheel gets “jammed” in one direction due to the force of the speeding car, the teens must successfully avoid an accident in order to continue the lessons. “We hope to build muscle memory for when these situations actually occur,” Leboff says, citing the example of learning to avoid obstacles at higher speeds by taking the foot off the gas and turning the wheel inward, rather than stomping on the brake and potentially going into a skid. While Hotseat Chassis provides the physical construct, The Cooper Union team is charged with creating and configuring the user experience. To do that, The C. V. Starr Research Foundation Director, Yash Risbud, has recruited two juniors, Eric Leong (ME) and Vasily Kuksenkov (EE), as well as John Hawk, a mechanical engineering Master's candidate. During a recent visit to the lab Kuksenkov tweaked the terrain of a virtual landscape using a gaming physics engine called Unity. “We will assemble different scenarios to create a full learning sequence,” Risbud says, “with each ‘chapter’ mimicking a different potential driving experience, taking into account a large number of variables including the geography, time of day and environmental conditions.” This level of flexibility will allow the user experience to be tailored to the scenarios that are most likely to occur for that individual. If a student fails to accomplish the goal of each track he or she must start over again. Already attracting media attention, including an article and a video on Forbes.com, the Defensive Teen project has an ambitious schedule. Leboff and Risbud look to have the sample tracks completed for demonstration at the 2013 End-of-Year show. Rolling out prototypes to select high schools and gathering data would quickly follow this. In five years they conceive of a revenue-generating business that also does real good in the world. If the Defensive Teen project takes off there would be many benefits, according to Risbud. "Any partnerships we have with private industry are a win for our students because it exposes them to real-life project work," Risbud says. "Secondly, the benefits of this program will certainly resonate with our public officials and provide other opportunities to work with the city and state on other initiatives that directly benefit all of our residents. Lastly, and most importantly, we project that an overwhelming majority of the students who take the course will be safer, better drivers, reducing the severity of accidents and potential fatalities. I would call that a success on several levels, and believe others will feel the same way."